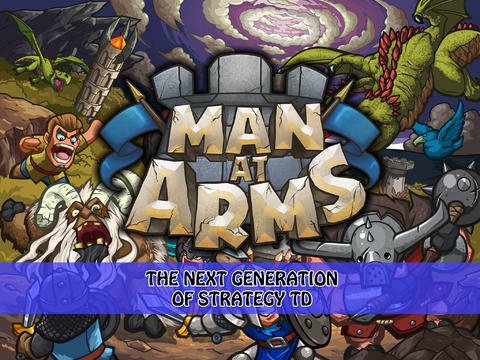 Man at Arms TD is a top-down tower defense game for iPad from developer Inert Soap. 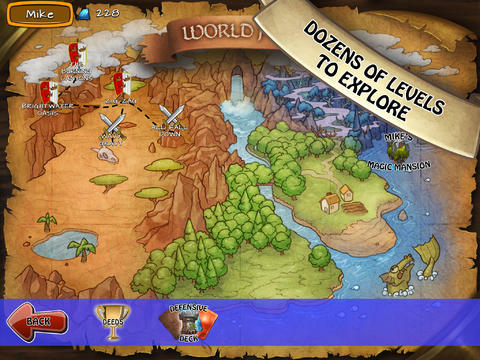 The game begins with the player setting up a new profile and visiting the World Map where you can see the stages currently available to you. Just tap on a level to jump right in – you’ll see a brief description of the stage as well as the ability to alter the difficulty level before getting started. 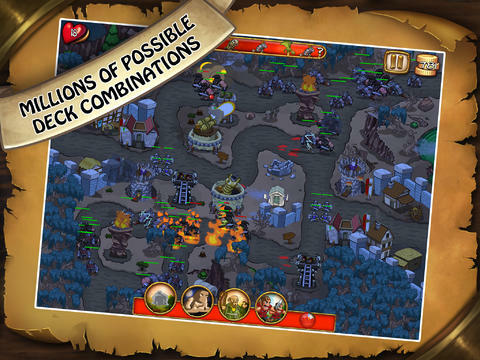 The layout of the game is similar to other Tower Defense titles and fans of the genre will be able to quickly get in to the action. The map has a number of designated zones where you can lay down defenses – simply tap on one to construct buildings such as barracks, artillery and archer outposts. Once you’re finished with your defensive placements, the game begins and successive waves of enemy troops will enter from one side of the map and attempt to make it across to the other side. You gain coins through defeating enemies that enable you to upgrade your defences as you play. Each stage ends either after all of your lives are exhausted, or you manage to defeat the enemy. 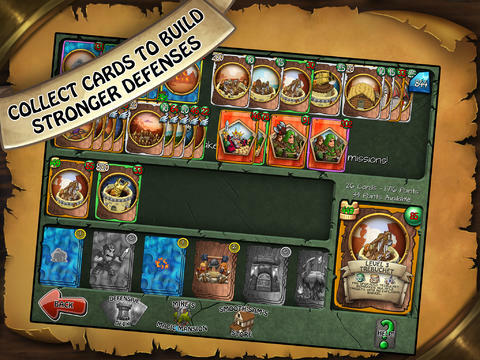 The spoils of victory include special cards which can be used later in the game. Each card confers special abilities or upgrades which can be compiled in a ‘defensive deck’ or combined in Mike’s Mansion of Magic to create new and more powerful cards. The are many game stages in Man at Arms TD and the levels cover a wide range of beautifully drawn environments including deserts, forests and swamps. Man at Arms TD features high-quality cartoon-style graphics, with bright colors and an excellent level of visual detail. There are a huge number of unique enemies that you encounter throughout the game so you have to keep modifying your strategy to keep up. There are fast enemies that zip past your troops, flying enemies as well as ranged monsters. The interface is very intuitive though, and allows you to manage your defenses with ease during the heat of battle. In addition to all of the pre-scripted gameplay, Man at Arms TD also comes with a free level editor that lets you create your own stages to play or to send to friends. Man at Arms TD is available now on the App Store for $4.99. Man at Arms TD requires iOS 5.1 or later. Compatible with iPad. Follow Tapscape for reviews of all the best iPhone tower defense games.